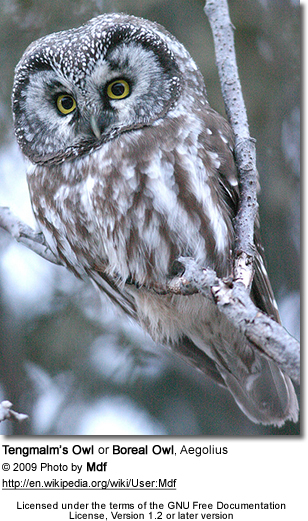 Aegolius is a small genus of owls with a range that is mostly restricted to the New World (the Americas), except for the Tengmalm's Owl with a range that extends into Eurasia. These owls inhabit temperate or colder climates. The northern species breed in North America’s coniferous forests. The southern species inhabit mountain cloud or oak forests. These are mostly resident birds, although the northern species may move south or to lower altitudes in autumn. 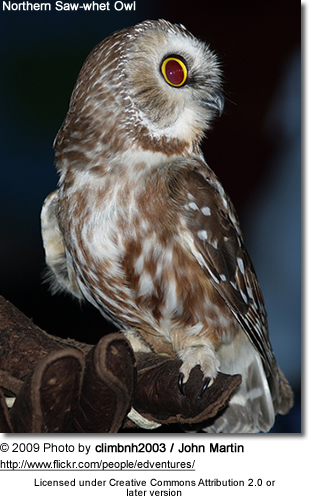 These owls are small, short tailed and broad winged. The head is large, with yellow eyes and a well-defined, large round facial disc. They vary in size from 18-27 cm in length. The plumage is dark brown or black above. Below they are whitish or buff, marked with either with streaks or spots in the two northern forms. Their flight is strong and agile. They mostly feed on rodents and other small mammals; but will also take birds, bats, insects and other invertebrates (insects, worms, etc.). They breed in tree cavities. During the breeding season, they make repetitive whistling calls.